The El Matador is a beautiful complex that sits on 12 acres of landscaped beachfront property on Okaloosa Island in Fort Walton Beach, Florida. The complex very large, offering 6 different buildings spread along beach property with numerous amenities. 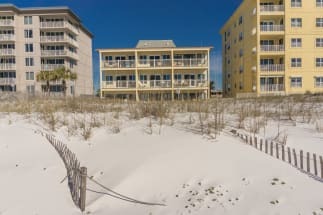 Enjoy the sugar white sand, sparkling emerald water, tennis courts, basketball courts, a sauna, fitness center, a Gulf front pool, BBQ grills, and a whirlpool tub. The El Matador offers it all, it's the perfect destination for a family vacation, a retreat, or a couples trip. The El Matador offers the opportunity for relaxation coupled with an action-packed vacation for the whole family. Whether it's playing tennis in the morning, parasailing during the day or heading the Okaloosa pier for a drink and a sunset in the afternoon, the El Matador has the opportunity for it all. Enjoy incredible seafood restaurants, countless shopping, or simply long walks down the beach. One of the most popular activities in the area is golfing. The El Matador is located within driving distance of at least 12 golf courses. Fishing is also abundant in the area and the pier is home to some incredible fish stories. Plan your trip to the El Matador with ECBYO. Find your favorite condo and use the Email Owner button or phone number located on each listing. Enjoy your stay on the Emerald Coast!